Sorry for the slight delay, but I’ve been having health issues recently after my finals. Recovering from the brutal study has been very tough and I’m still in a horrible condition. I’m slowly recovering, but it’s tough to work like this. Additionally, this chapter had a lot of secrets in it, which is why it took so long. Enjoy this long edition of Chapter Secrets! Finally, after waiting for some moment, I could read your update about the secret in this chapter. And as usually, it is amazing theory !! I hope you get well soon. And I really enjoy your theory for this chapter 834. 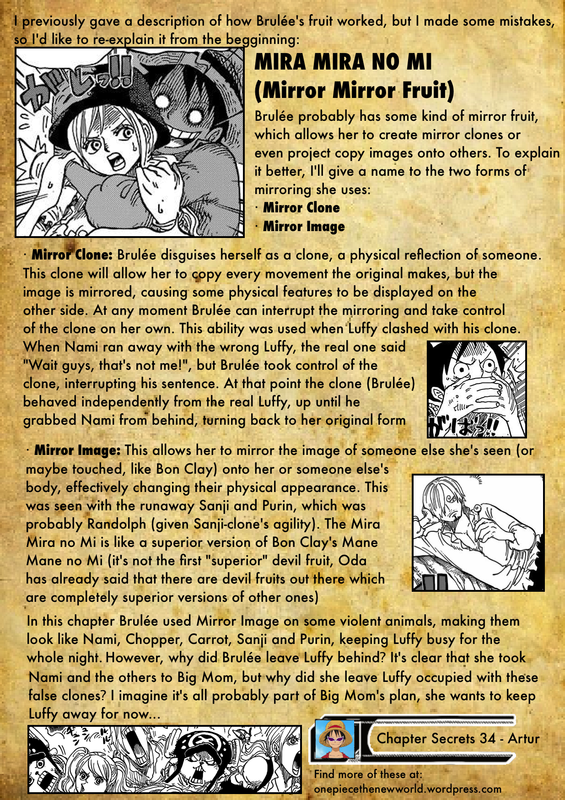 – The Vinsmoke duo: at least, Pudding’s innocence might depend on this. – The Pekoms stuff: at least, Pekoms’ life might depend on this. – The Ceasar stuff: Not that important, but I wonder why is “2 weeks”. If Luffy gonna retrieve Ceasar, it gonna happen soon. Why don’t Oda use a narrower deadline for dramatic purposes? Last but not least, I think we have a whole Day 4 for too few things (because the showdown should be at the Tea Party). So, either something rather big (but not SO huge) would happen on Day 4, or we miscalculated something. Day 2 – Straw Hats at Chocolatown. Tea Party in Three days. Ichiji in two days. Day 4 – The day before the Tea Party. Ichiji is back. – Yup, exactly as you said. I also found it weird the two week limit, especially with the tea party day being only 24 hours away. Almost completely agree with you sir! I’m just gonna add something. Firstly, I forgot about Ichiji and Niji (Day 4 just has some more anticipation). What I mean by “the Vinsmoke duo” is the Sanji vs Judge fight (I misuse the word, it should be “duet”). If Sanji was cuffed on Day 3, Pudding might have some chances telling Sanji about the Straw Hats on Day 2. 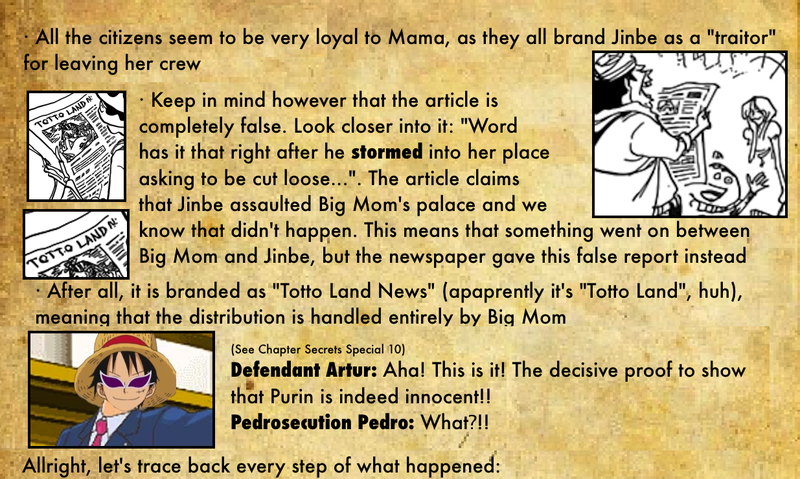 Secondly, if Pekoms was shot on Day 2, Jinbe could rescue him (the Sun Pirates seemed to follow the Sunny team all along, at least from Chocotown). Otherwise, why Bege / Bege’s crew bother moving Pekoms all the way to WCI? Nonetheless, if there was a rescue, Pekoms is now resting at the fishmen’s place, preparing for the Tea Party accordingly to Bege’s plan. All in all, thank you very much for your work. I hope you get well soon. I think Pekoms got shot on day 3, the one that would rescue him would be one of Jinbe’s men (who must be waiting for him nearby Whole Cake) or Jinbe himself, wherever he is now. 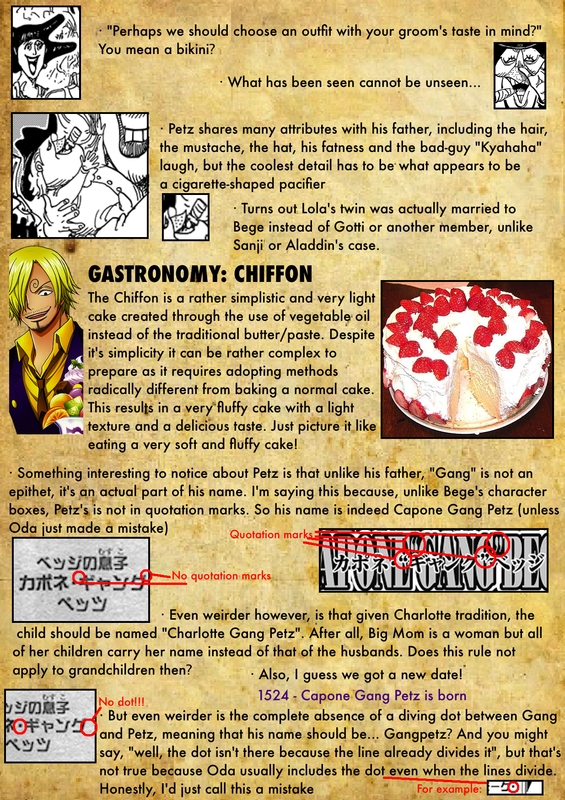 I’m not exactly sure what you meant, but Pekoms was shot at Whole Cake, even the box says “Whole Cake Island, North-Eastern coast”, to me it seems clear that he was shot on Day 3. 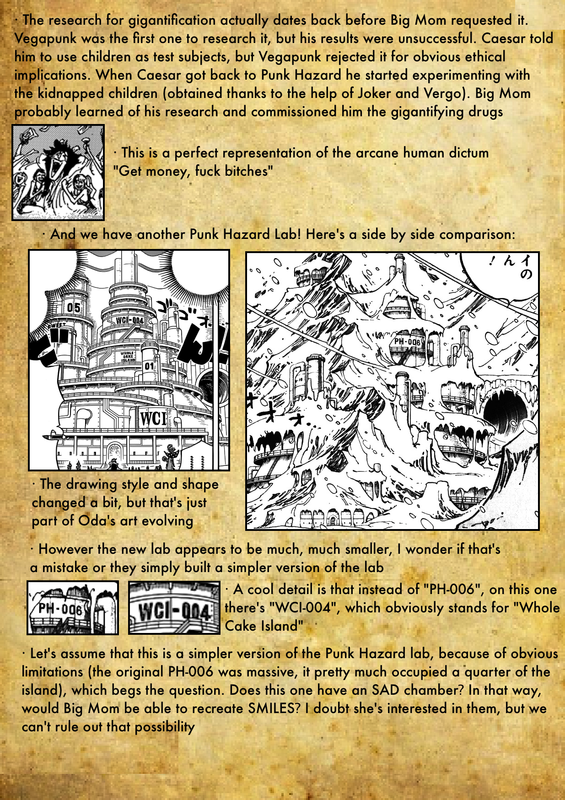 I think that anything outside of flashback (which Oda indicates with dark outlines outside of the panel, which means the Sanji thing and the Pekoms thing all happened on Day 3) happened on Day 3. I will clarify what I mean. I assume that Jinbe has been imprisoned by Big Mom since the Roulette (Day 2). So, Jinbe himself could save Pekoms only if Pekoms got shot on Day 2. 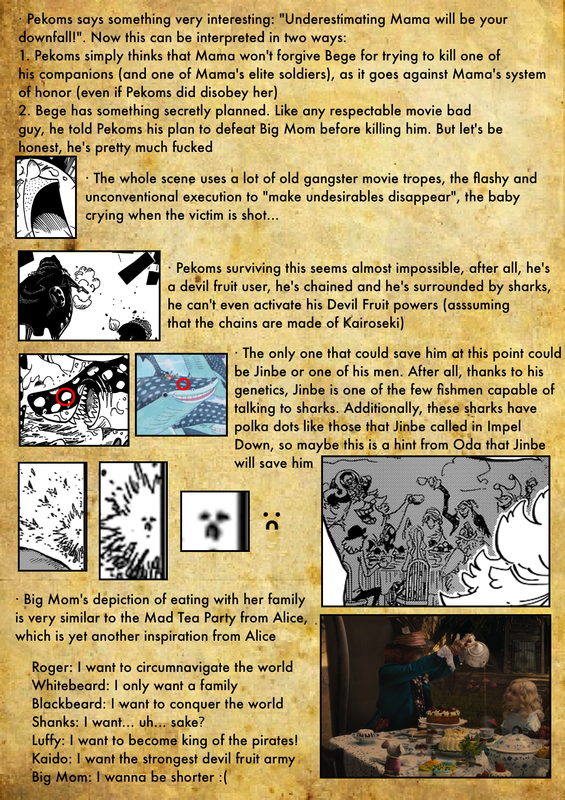 Otherwise, if Pekoms got shot on Day 3, yes Jinbe’s men could rescue Pekoms instead, but my wonder is why Bege / Bege’s men had to capture Pekoms in Chocotown and brought Pekoms all the way to WCI just for execution. As for the flashback outlines, I know about those, but I think that when nobody is actually reminiscing, we still can have different timelines in one chapter, just slightly different. Thanks for the shout-out! 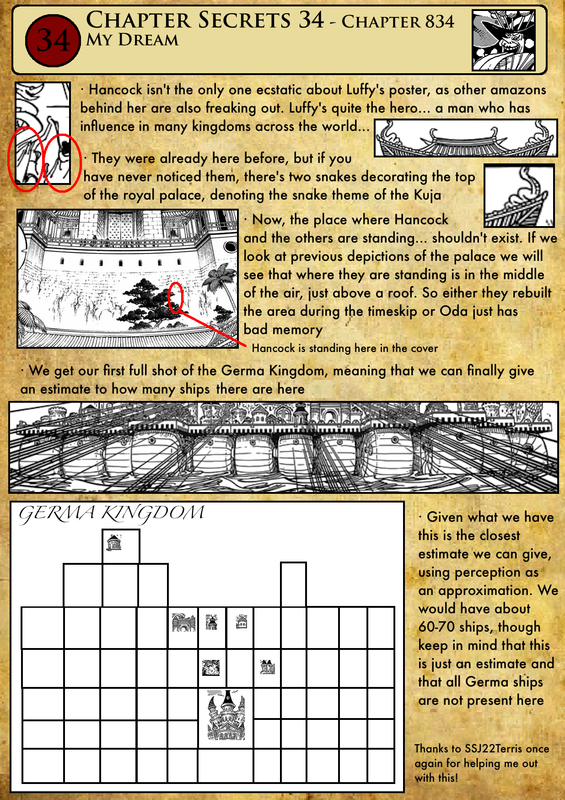 Hopefully we can get a really good vertical shot to help clarify all of this Germa stuff for good. Super weird though that the one side has the end row facing inward, while the other side has the end row facing forward. y’know, for some reason, I didn’t make the connection between Perospero and Wonka, and I don’t know why. I’d also like to point out that, while it might be a bit obvious, but the town Brook and Pedro stop by seems to be Sweet City, as the architecture seems to be the same. Note the Balloons and the Ice-cream Cone Spires. Plus, the Fondue Fountain Building and Lollipop Ferris Wheel can be seen in this Chapter’s establishing shot, as well as at the scene of Big Mom’s rampage, so those spots might be very close to one another. This also confirms Sweet City is connected to the ocean. Though there doesn’t seem to be any industry there on the coast, so the Shark Submerge may have only accessed that coast by underwater tunnel, or there is simply a better access rout to the sea elsewhere in Sweet City, and that is where the docks and pier’s are. And while it’s pretty obvious, I’ll also go ahead and say that the flower looking at Brook and Pedro seems to imply the sentient plants and objects on Whole Cake are responsible for Big Mom’s great info network. Brook and Pedro accessed through the river of the city, the same one they took back in Chapter 831. Oh wow that’s a fantastic catch! The flowers really seem to be looking at them! I don’t think it’s the flowers alone though, it’s probably many living inanimate objects around the archipelago that keep tabs on them. oops. so I did! XD well still, it does seem as if it’s pretty close to where Big Mom’s rampage was. Sorry you’re having a rough week. Hope it gets better here on out! and that you can kick that sickness from Finals week!